March 29, 2015 was a special day. Last Sunday was my Mom's 75th birthday but more importantly, Palm Sunday. My pastor, Mark Shaw preached from Matthew 21:1-11 about the coming of Jesus our King into Jerusalem. I learned two important symbolic things about the entrance of Jesus into the city. I can't wait to share them with you. 1. Jesus came into the city on a colt or foal, a young donkey, a young unbroken, untamed donkey. Jewish culture knew riding into town on a donkey was the sign of royalty. Jesus riding in on an "untamed, unbroken" donkey was symbolic of new, unmatched peace. Jesus was bringing a peace that had never been known before to mankind. 2. Matthew 21:8 says "And a very great multitude spread their garments in the way; others cut down branches from the trees, and strawed them in the way." The people of the city laid down their clothes for Jesus to ride on. 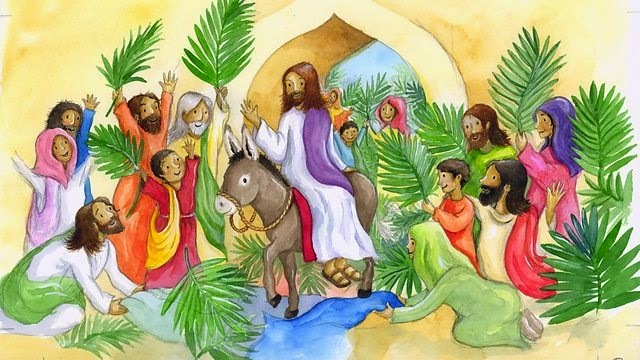 Other people cut palm branches from trees for him to pass on, hence the name Palm Sunday. Again, the Jewish culture knew these actions toward Jesus were praising him as the King of Kings and Lord of Lords. Our Hosanna in the Highest! 2. How do I show my respect and praise for the King? There aren't any palm trees in North Georgia. We are still sending out a message of some sort every day. Outside the church walls where others see us most, how do we show our respect and praise for Jesus? Do people even recognize that we hail him King of Kings? Think about it this way...can people "read your palm"?